The 340B drug discount program helps disproportionate share hospitals (DSHs) to serve low-income patients. The stated objective of the 340B drug discount program is to “stretch federal resources as far as possible reaching more eligible patients and providing more comprehensive services.” Over time the program has become controversial due to inadequate oversight of participating affiliate clinics and pharmacies. Since 2010, the GAO reported that the number of participating clinics has tripled and the number of pharmacies has grown tenfold. 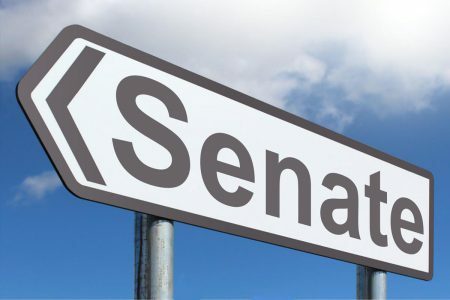 Legislators question whether or not the additional affiliates are utilizing the benefits of the program in line with the original goal of the 340B drug discount program. In an effort to ensure sustainability, lawmakers have introduced the 340B Pause Act and the 340B Help Act. These bills attempt to clarify the responsibilities of 340B program participants and introduce methods of improved oversight. The 340B program gives its participating covered entities significant discounts on outpatient drugs. The savings result in additional revenue that can be reinvested for increased patient services. Government officials are calling for 340B reform because they suspect improper practices among participating hospitals. Since the number of Americans requiring assistance to purchase prescription drugs is increasing, lawmakers want to ensure that the program is not being taken advantage of by medical providers for additional income. In order for the 340B program to continue its goal of providing low-income patients with prescriptions and services, it is important to verify that the program discounts are reinvested into safety-net care. HRSA is responsible for managing and overseeing the 340B drug discount program. As the number of entities that participate in the program increases, it’s become evident that its oversight is lacking. As a result, promoting the core objective of 340B has become a challenge. According to a report from the House of Representatives, the program needs to address its reporting requirements and HRSA lacks regulatory authority. The report highlights that under current rules, DSH hospitals are not required to reinvest 340B savings into safety-net care. As a result, medical providers can retain the funds for profit while patient services are not expanded. Additionally, HRSA lacks the resources to perform the necessary audits to oversee the program. Almost 98% of covered 340B entities where not audited in 2016. Lawmakers are currently considering the aforementioned reforms known as The Pause Act and The Help Act. Both aim to increase oversight and determine the obligations of hospitals and health centers participating in the 340B drug discount program. Additionally, the proposed legislation includes a 2-year moratorium on the enrollment of new DSHs, clinics, and contract pharmacies. Each proposal also includes reporting requirements with additional conditions for clinics and pharmacies. 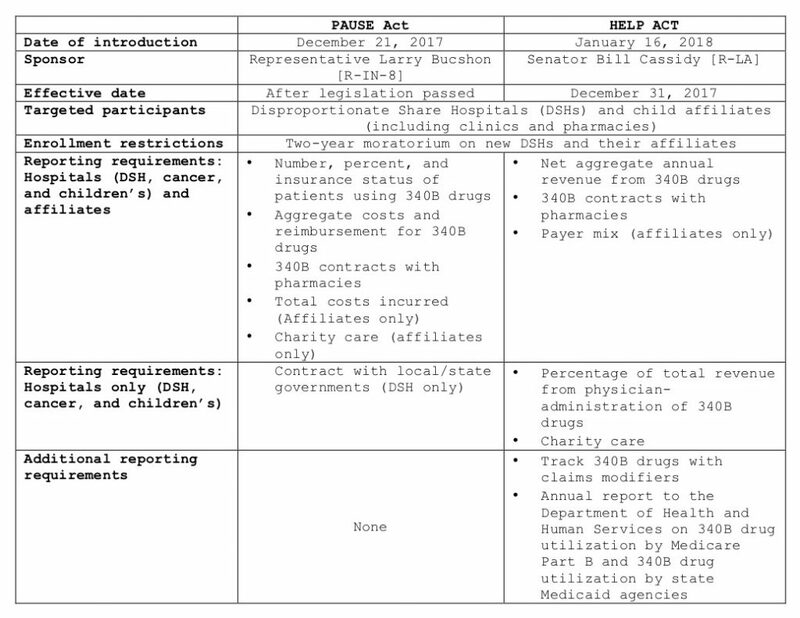 The following chart from Health Affairs Blog outlines the differences in both proposals. At the moment, charity care and uncompensated care are the only measures contributing to safety-net investment. To increase engagement, other means of measuring safety-net engagement have been suggested. For instance, determining service lines provided by hospitals and money used for community benefits. Including community benefits reporting, similarly to what is found in Medicare with non-profit status for hospitals, could also be beneficial. If this were a condition of the 340B drug discount program reform, HRSA would have sufficient indications of the services offered to low-income communities by DSH hospitals and their affiliates. The 340B Drug Discount program has grown substantially since its introduction and it is veering from its original goal. Due to the potential for abuse and improper practices within participating hospitals, legislators are considering reform.